With SEMA 2018 season upon us, manufacturers are preparing to show off their custom creations at the largest showcase of aftermarket vehicles and accessories. 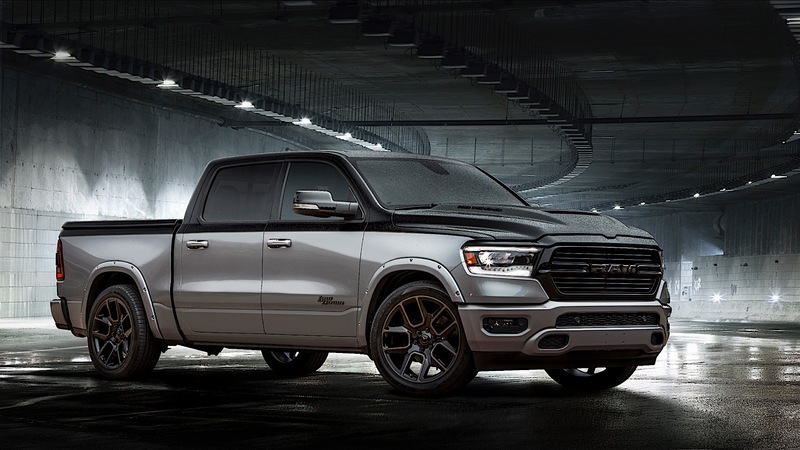 For Mopar, the tuning division of Fiat Chrysler Automobiles, that means bringing two new modified trucks, the Rebel and "Low Down" concepts, to the show floor in Las Vegas. 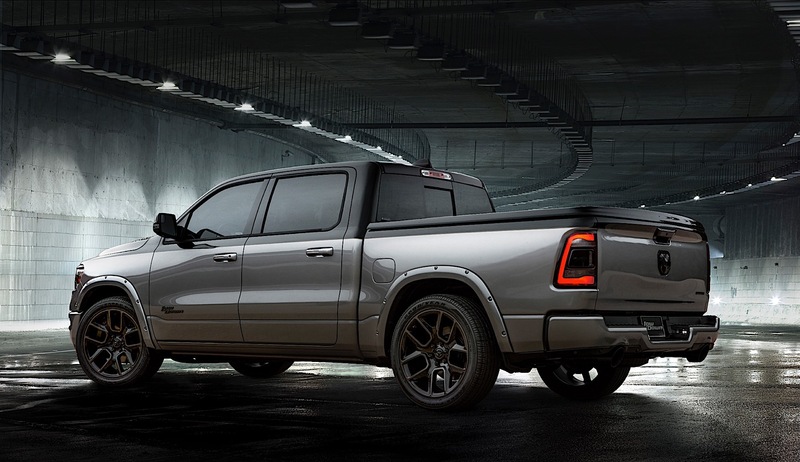 Ram's 1500 half-ton truck was updated for 2019 and both of these pickups are based on the new platform for this model year. The two are powered by a 5.7-liter Hemi V-8 and are equipped with Mopar's Ram Airflow intake system. 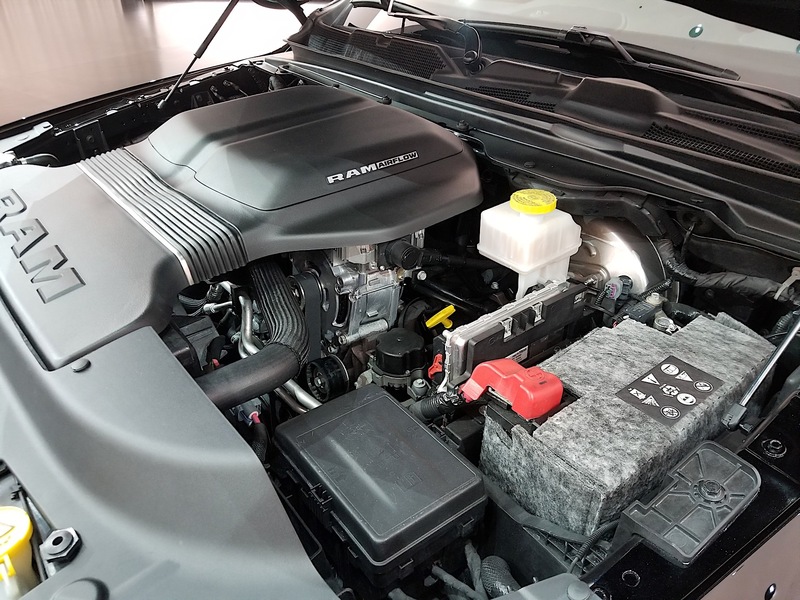 While the company doesn't cite performance numbers, the intake likely adds a couple of horsepower to the engine's potent 395 hp that comes standard. 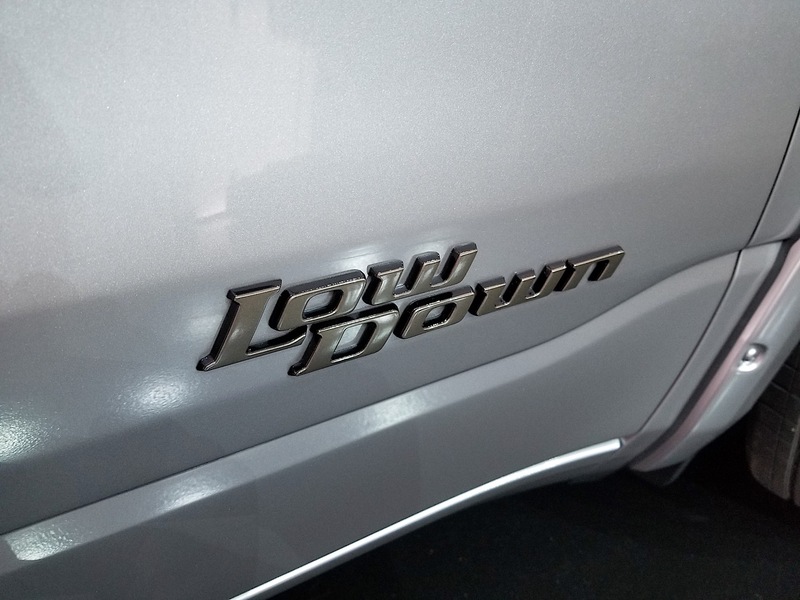 Starting with the "Low Down" truck, Ram took a 1500 Big Horn—a volume model—and lowered it by two inches. It sports a "Brassphault" color palette, which is a two-tone setup where the upper body is Gloss Black and the lower body is Billet Silver with a Brass Monkey stripe. All of the exterior badging is also glossy black. 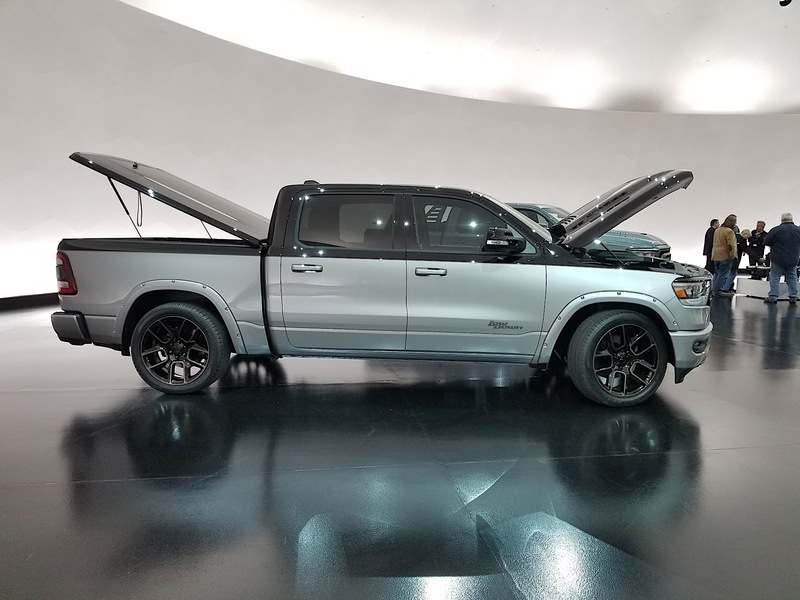 The truck has a Mopar conceptual performance hood, 22-inch oversized production wheels that are colored in Gloss Black with Brass Monkey accents, and has concept wheel flares. A one-piece tonneau cover and 5-inch exhaust tips are also body-colored Gloss Black. Inside, there are Mopar all-weather floor mats, brushed and polished door sill guards with the RAM logo, and a bright pedal kit. The Drive was able to check out the truck a few days ago in person and the color is both striking and subtle. It looks like a high-performance street truck. Since it’s based on a volume model, it's something that wouldn't be too terribly difficult to replicate in real life for a tuner who was looking for something similar. The Rebel Concept goes in the opposite direction. 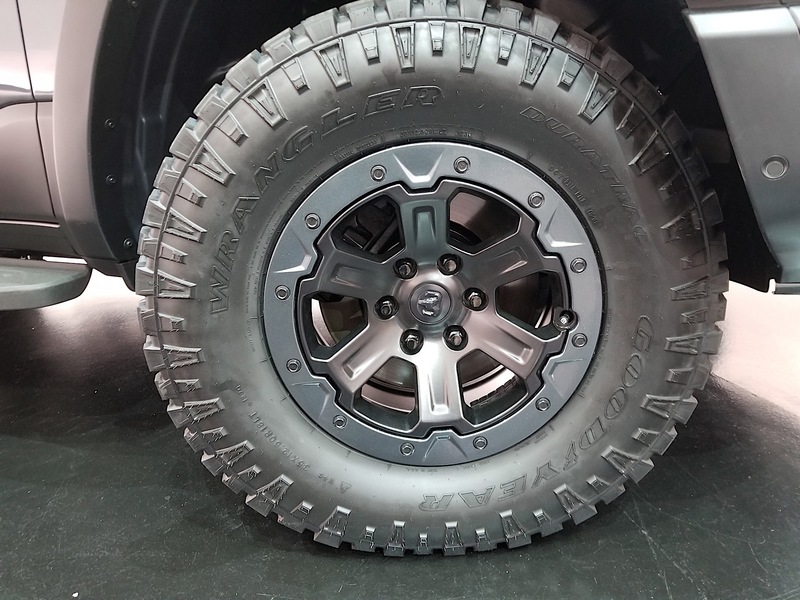 Based off of the 2019 Ram Rebel, the truck is raised two inches over stock. The stock Rebel didn't have the air suspension, just steel springs. 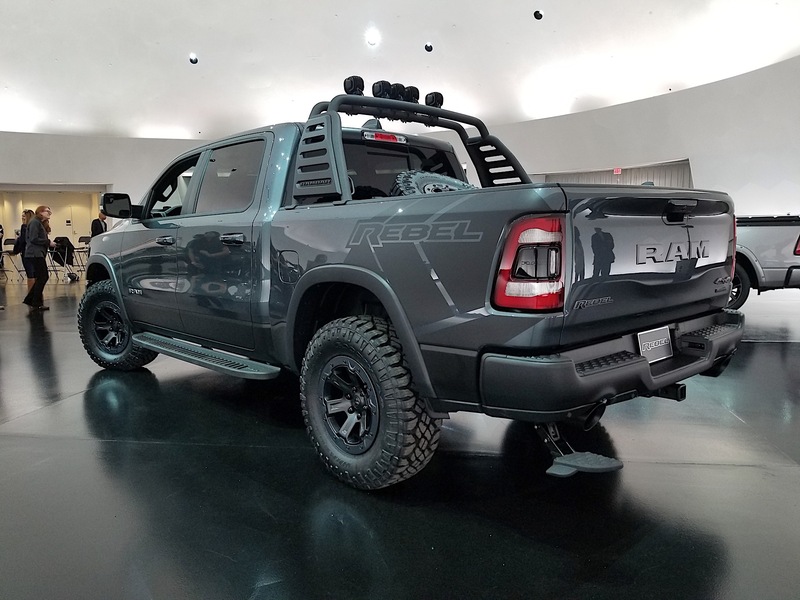 The 2019 Rebel allows the owner to choose, giving them a bit more freedom to customize than before. 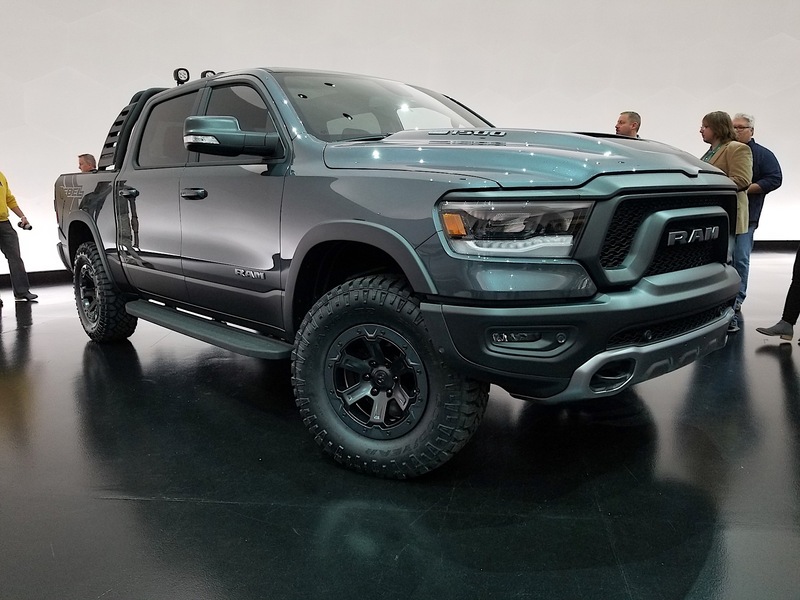 The truck is painted in a custom blue called "Rebel Smoke," and also includes one-piece cast-aluminum Mopar running boards, Satin Black beadlock wheels wrapped in 35-inch Goodyear Duratrac tires, and production wheel flares with grey metallic skid plates wrap out the protection. 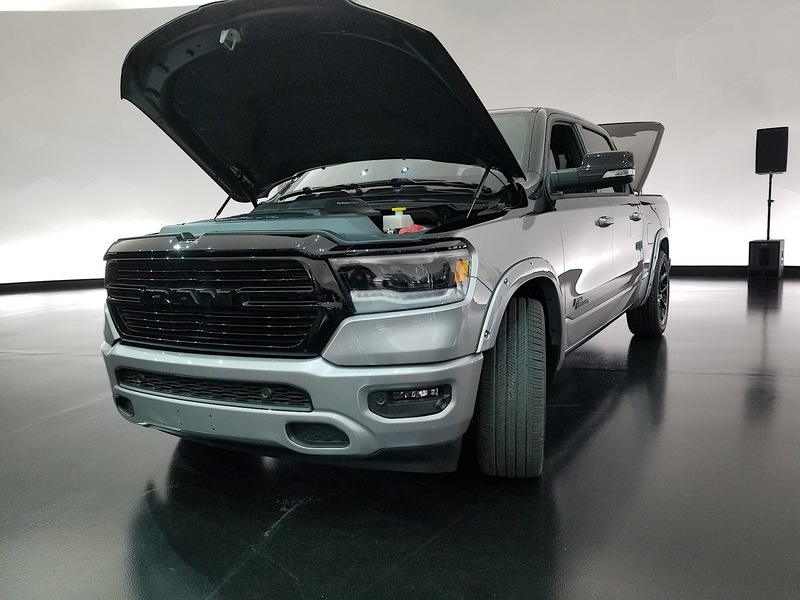 A conceptual Ram Bar in the bed, first seen on the Rebel TRX Concept truck, acts as a mounting location for 5-inch LED lights. 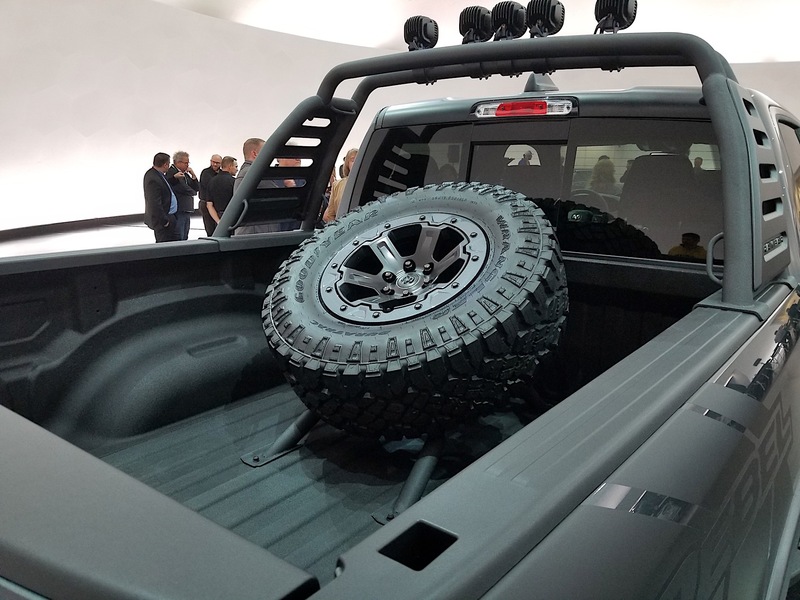 Also in the bed is a concept spare tire carrier, Mopar bed step, and a black spray-in bedliner. 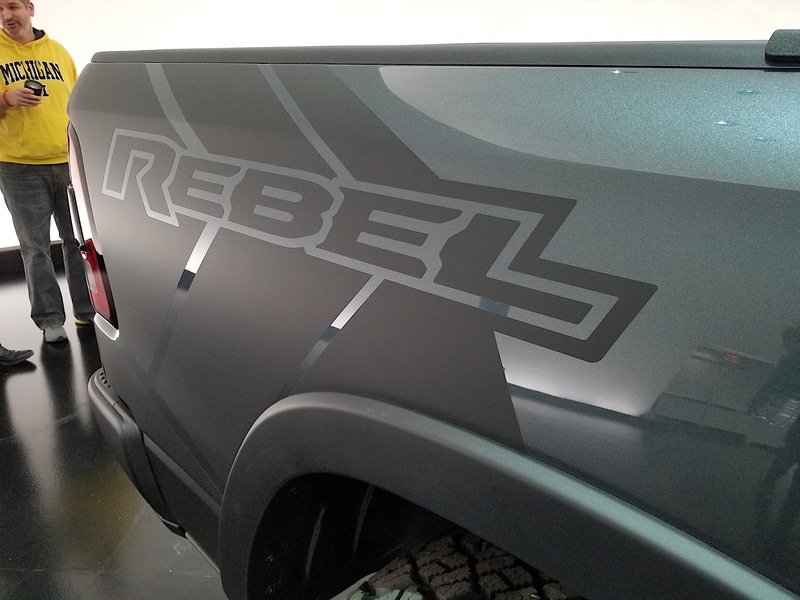 Special satin black Rebel graphics add a subtle touch to the exterior bed sides, and the exhaust tips are also 5-inch units in Gloss Black. 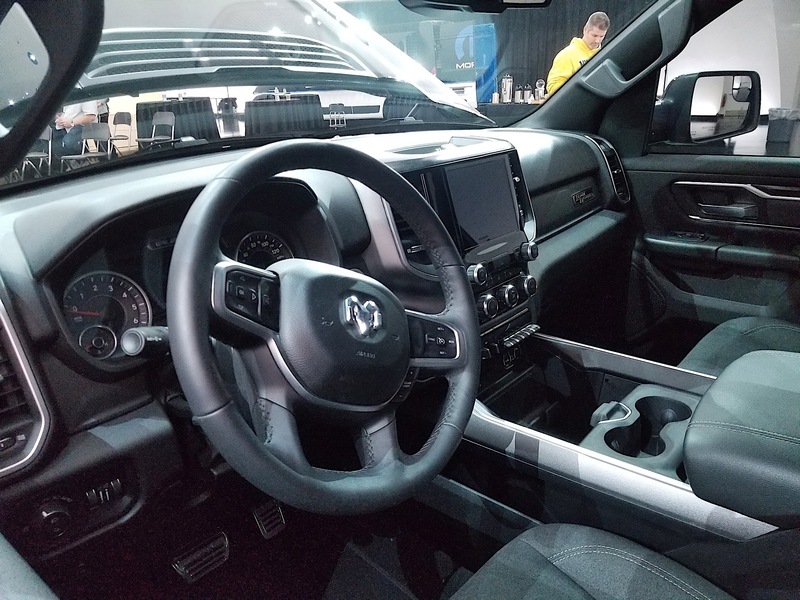 This truck has a monochromatic interior, which is a departure from the red interior of the standard version, with all-weather mats, brushed and polished door sill guards, wireless charging, and a concept pedal kit. 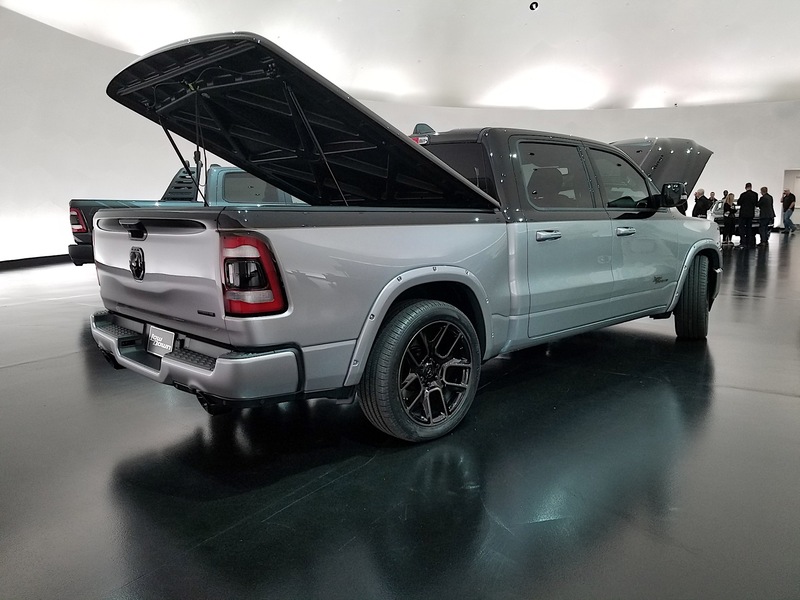 The Drive asked Joe Dehner, head of Ram Trucks exterior design, if this truck was a tease of the upcoming production Ram Rebel TRX, to which he replied, "What's a TRX?" with a smile. 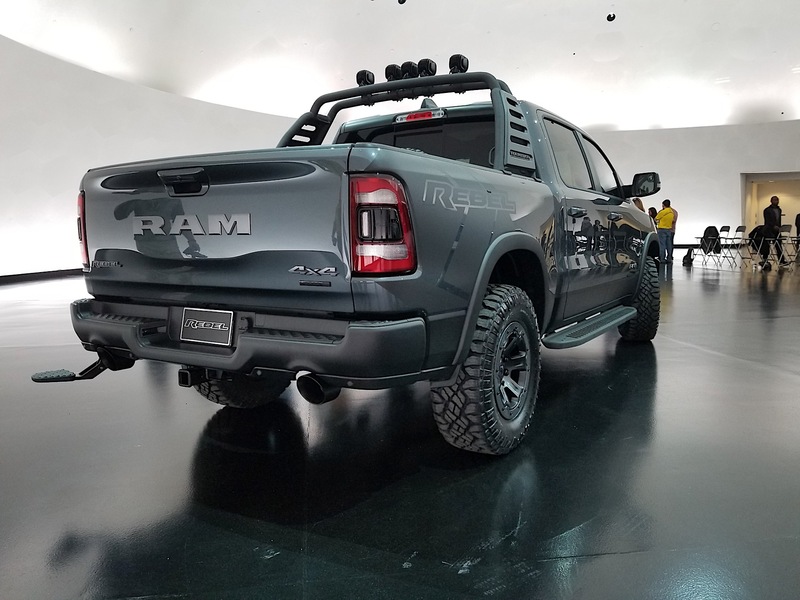 While the company won't confirm any details, the Ram Bar was seen on the TRX concept, and it seems logical that both the Bar and the spare tire carrier would make it to the final version. The hood also looks like a piece you should expect to see in the future on production trucks and through Mopar. While it's a concept now, Mopar is strongly looking at putting it into production according to sources within the tuning branch. That's especially true if the public likes what it sees on these concept trucks. 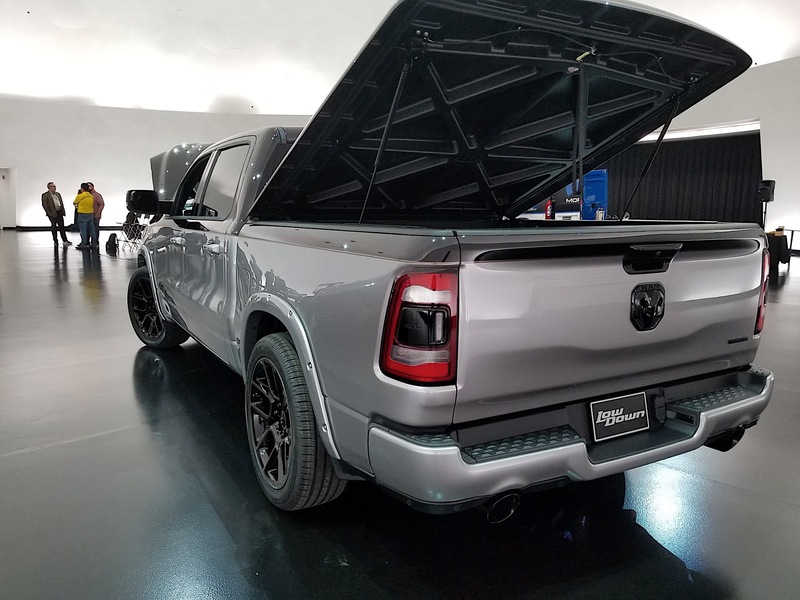 You can check out both of these trucks at SEMA 2018, along with a full lineup of Mopar goodies and activities like a "Drag Strip Showdown" to keep fans entertained during their time in Las Vegas.